“The private sector profitability combined with talent and education is in our DNA, and 400 years later we are launching the next wave of this private sector company through the investments we are making,” says Liz Povar, vice president for business expansion, Virginia Economic Development Partnership (VEDP). This year, legislators passed a significant transportation bill, which creates a permanent program, eliminating the 17.5 cent sales gas tax, replacing it with a percentage based tax tied to wholesale costs. “This is a shift in how we do transportation, which we take seriously because transportation links us to the global economy,” Povar says. In addition to supporting enhancements to road and airport systems, the funds will be used to grow the Port of Virginia. The port links to more than 80 foreign ports, reaches more than 200 countries, and also boasts a 22-day transit time from Asia. Also this year, legislators increased funding for the Trade Defense Initiative. The downsizing of the federal government will have ripple effects across the commonwealth’s economy, where a significant portion is tied to the federal government. The additional dollars will assist companies in opening up new markets for their products. “We believe this is one of the best existing programs in the country and we believe it will help mitigate the impact of the federal defense slow down,” Povar says. A study has determined the number of companies impacted by the federal government in regard to how many have the government as a main contractor or their primary market audience. The next step is to review the companies themselves, not just the size of the market, in order to provide support, building on the state’s Virginia Leaders in Export Trade (VALET) program. The program offers technical assistance to companies in regard to exporting, as well as knowledge of which markets and which countries can use their products. The program reaches out to a network of universities across the world to provide companies with market research as well as access to technical experts such as accountants so they can conduct further analysis. “Companies enrolled in our VALET program typically see an increase of 50 percent in their export revenue over a two-year period,” Povar adds. Manassas, located in the Washington, D.C., metro, has become an emerging business destination for people affected by the sequestration who are starting their own businesses. “We have a culture of helping startups grow,” says Liz Via-Gossman, director, city of Manassas Office of Community and Economic Development. Resources include a city-wide technology zone that offers support to assist businesses that are technology oriented. And the Economic Development Authority is looking at implementing a small loan program, in the $50,000 range. In other initiatives geared toward entrepreneurs, in James City County, the Mason School of Business at the College of William & Mary manages the regional business and technology incubator. The incubator has graduated several startups, and currently is home to four startups, with two applications pending. The city county provides the amenities at the two-story office building. “In addition, if a startup needs access to the school of business, but doesn’t need a physical location, they are able to receive services as a virtual client,” says Russell Seymour, director, James City County Office of Economic Development. With news of cybersecurity leaks and attacks gracing the headlines in regard to national and international security, Virginia’s cybersecurity sector is poised to thrive as the nation works to overcome the challenges. Virginia is home to a depth of knowledge workers, principally in northern Virginia, Hampton Roads and Richmond. “Because of our connectivity through the Internet we have the backbone, fiber and architecture to safely and securely house cybersecurity related tasks,” Povar says. 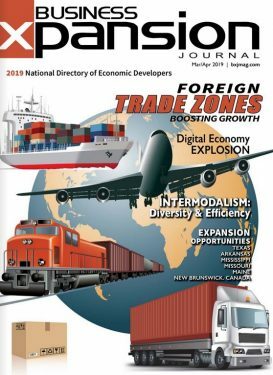 Another strong industry sector in Virginia centers on international logistics-related functions. The Commonwealth Center for Advanced Logistics Systems will support the analysis and potential and growth in big data as it relates to logistics systems, and how companies come to understand supply chains and how best to connect with suppliers, and where the best locations are to site distribution operations. Along the theme of industry-related centers, Virginia is also home to the Commonwealth Center for Advanced Manufacturing (CCAM). “We have five research universities and we believe the distributed research network we are creating through intentional investments allows us to differentiate ourselves from other states because businesses want to solve problems, not just conduct research,” Povar says. The CCAM is located adjacent to the 1,000-acre Rolls-Royce campus in Prince George County. In December, Rolls-Royce announced it will build a second advanced manufacturing facility at the campus. The airfoil machining facility will produce turbine blades and nozzle guide vanes for aerospace engines, and will be located next to the rotatives manufacturing facility, which produces engine discs. The presence of Rolls-Royce is expected to attract suppliers to the Prince George County region. Mecklenburg, Lunenburg and Pittsylvania counties are among those poised to support these suppliers and the talent base needed at Rolls-Royce. Tourism is another industry important to Virginia’s communities. Many of the communities are home to historic old towns. The buildings in downtown Manassas are post-Civil War because everything burned down in two battles. The community is carrying out capital improvements, which includes widening the sidewalks to accommodate outdoor dining, as well as improving schools and parks. “We are beginning to see a lot of restaurants opening as chefs and independent businesses come in; we have become quite the dining destination,” Via-Gossman says. James City County is also boosting tourism attractions, targeting sporting events. The Warhill Sports Complex features baseball fields, soccer fields, an indoor sports center, and an artificial turf football stadium. Moving southwest to Lunenburg County, the city of Victoria is involved in the Roanoke River Rails to Trails project. “Victoria used to be a railroad town and they are interested in promoting tourist activities along the old Virginian Railroad line,” Hawthorne says. Moving west in the commonwealth to Pittsylvania County, the Dan River Region Collaborative is a workforce development group tasked with ensuring workers are career ready. Sides says the Virginia Tobacco Commission funded a workforce study of the state’s southern tobacco region, which identified a shortage of precision machinists, welders and industrial maintenance technicians. One area of training in Pittsylvania County will focus on precision machining. A $1 million initiative will equip a classroom at the education center. Danville is also home to the Institute for Advanced Learning and Research, which specializes in instruction in pharma, life sciences, bioenergy and polymers. The intention is to move the research into the commercial phase within the surrounding area. Virginia’s communities offer an inventory of shovel-ready sites so businesses can move quickly with their expansion plans. Pittsylvania County is home to the Berry Hill Road Industrial Park, a 3,500-acre site ideal for large-scale industrial developments, such as automotive and aerospace manufacturers. Funding is available to grade a development pad of 230 acres, complete with water and sewer, Sides notes. “Our goal is to have development ready sites ranging from 2 acres to 230 acres with utilities in place,” he says. There are also sites throughout the county that are development ready. The county is also home to an HP data center site. Mecklenburg County is home to more product than any other county in the state as far as land, Kellett notes, home to eight industrial parks, most of which are located in an Enterprise Zone. Another park, the 28-acre Lunenburg-Victoria Industrial Park, which is less developed, is served by the town of Victoria’s water and sewer services, with a sewer plant adjoining the site. The site is also on Route 40, and is served by Mid-Atlantic Broadband’s fiber network. Other advantages of Lunenburg County include its status as a state Enterprise zone, which applies to the industrial parks in Kenbridge and Victoria as well as other acreage. The county is also designated as a federal HUB Zone until 2020. Businesses located in these zones are eligible for certain set-aside projects offered by the federal government. What’s more, Lunenburg is located in the tobacco region of the state, which is able to offer additional economic development grants. Virginia took first place in the U.S. Chamber of Commerce’s Enterprising States 2013 report for the general standard of living: median family income adjusted for cost of living. What’s more, in 2012, MoneyRates.com ranked Virginia the Best State to Make a Living. *Home to more than 5.4 million people in the 16-64 age range, Virginia ranks 12th in the nation for prime working population as a percentage of total population. *Virginia is home to 11 federally funded R&D centers, and 20 FLC Laboratories such as the Homeland Security Institute, NASA Langley Research Center, and the Thomas Jefferson National Accelerator Facility. *The Howard Hughes Medical Institute is modeled after collaborative science centers in Europe. The institute is home to more than 300 scientists involved in a range of disciplines in biomedical research. Virginia’s landscape includes mountains, rivers and beaches. The state is also home to 35 state parks, 22 national parks, more than 500 miles of trails and 119 national historic landmarks. Historic markers and attractions include those at Colonial Williamsburg, the Jamestown Settlement, Yorktown National Battlefield Monument, Monticello and numerous Civil War sites.